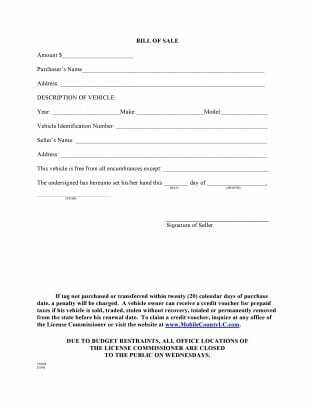 Mobile County Alabama Motor Vehicle Bill of Sale Form TG004 is a legal bill of sale template intended to provide the transfer of ownership of a motor vehicle within the jurisdiction of Mobile County of Alabama State. The TG004 Form requires input by both the seller and the buyer. However, a power of attorney is mandatory in case the seller wants to appoint an agent or dealer to sell the motor vehicle on his/her behalf. The buyer must transfer the title within 20 calendar days otherwise; it is liable for a penalty. The vehicle owner can use a provision to receive a prepaid tax credit voucher under certain conditions. Information about the same is available in the office of the License Commissioner. The TG004 Alabama Motor Vehicle Bill of Sale Form has three major parts and input in all fields is mandatory. The buyer must transfer the title of the motor vehicle or apply for a fresh one in case it is not available. The seller can provide the details of the encumbrances, if any in the space provided for the same. Notarization of the seller’s signature is not necessary for the legal standing of this bill of the sale document. The first part of the TG004 Bill of Sale Form requires inputs about the purchaser and the amount of sale of the motor vehicle. Please enter the amount of the sale on the first line of the form in US dollar. Then enter the legal name of the purchaser on the next line. Mention the address, city, state, and zip code of the purchaser. 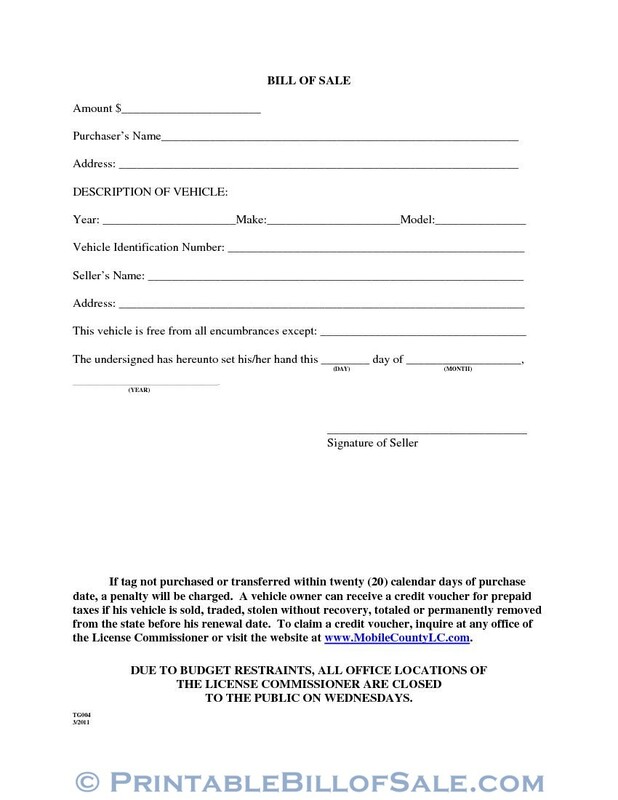 The last portion of the Alabama Motor Vehicle Bill of Sale Form has spaces for inputs about the seller and the signature of the seller. Please continue by entering seller’s legal name followed by the seller’s address, city, state, and zip code. You as a seller may choose to provide details of encumbrances, if any on the next line. Then enter the date in the required format like day, month, and year. The next input required from you is your signature as a seller. Please sign on the line provided for the same. Your authorized agent/dealer can sign on your behalf, provided such power of attorney granting the powers to transact on your behalf is enclosed with the TG004 Mobile County Alabama Motor Vehicle Bill of Sale Form.